The Sestiere of Porta Maggiore was created in 1956 for the historic reenactment of Quintana and it had to represent the new urban area extending eastwards beyond the Ponte Maggiore. The name Porta Maggiore comes from an ancient historic door built between 1586 and 1587 by Antonio Giosafatti. Unfortunately this historical building no longer exists. 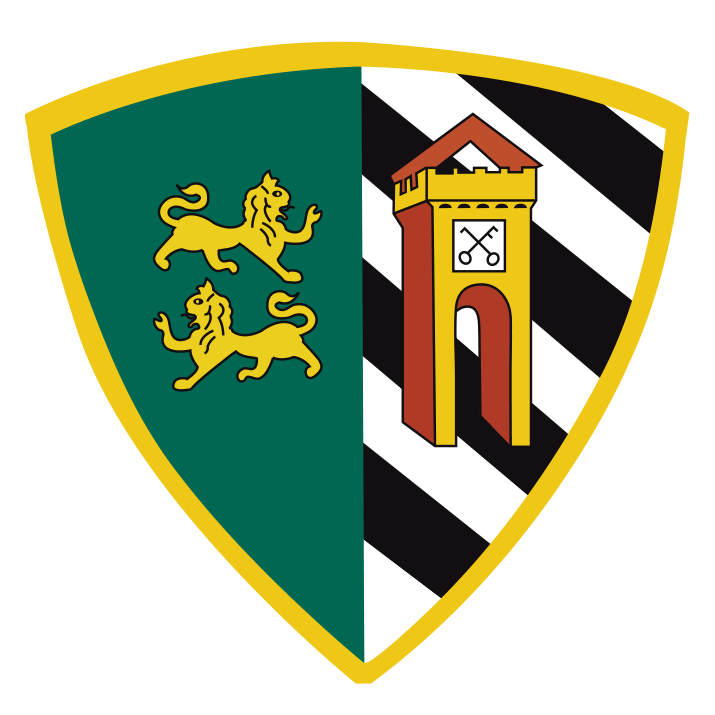 Walking through this district you will be able to discover many important attractions, such as the Forte Malatesta, the Cecco Bridge, the church of San Salvatore di Sotto and the stadium where the Quintana Horse Race takes place. 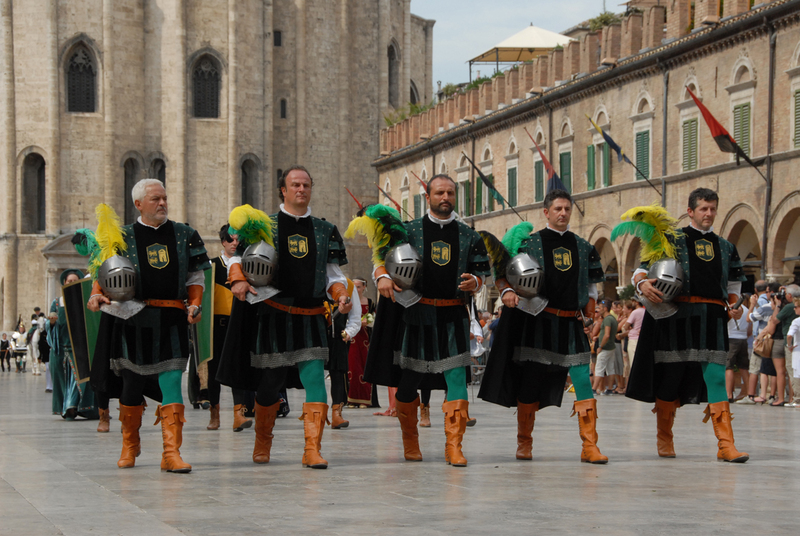 The historical, cultural, and spectacular style of the group of musicians and flag waivers of Porta Maggiore originates from the military flag waiving art information discovered between 1550 and 1700 by master masters. Historical researches are still underway and are showing the spectacular existence of the “Sbandieratore” – the flag waiver. Remaining faithful to the local tradition begun by Master Danilo Ciampini and continued by Master Giovanni Nardoni, the Porta Maggiore group has analyzed all the expressive details of their historical movements, going deeply into the analysis of its intimate soul and even extending the aesthetic value with new emotional signals and a renewed expressiveness. Every analysis aimed at representing a new and spectacular example of the behavior of the “Alfiere” on the battlefield. The group focuses on many different activities. 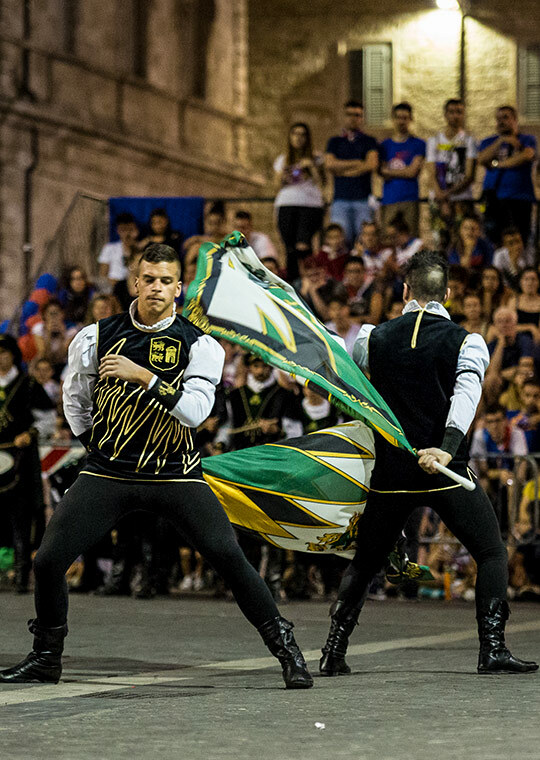 The main goal is to represent the military art of waiving the flag during the main event – “The Quintana Joust” – but they also promote this sport all over the world, on national and international squares, through choreographic plays performed with flags. The other very important activity is the creation of true narrative languages, giving value to the flag, as a great communicative vehicle of emotional sensations and vibrations.